Would you buy a truck from this man? 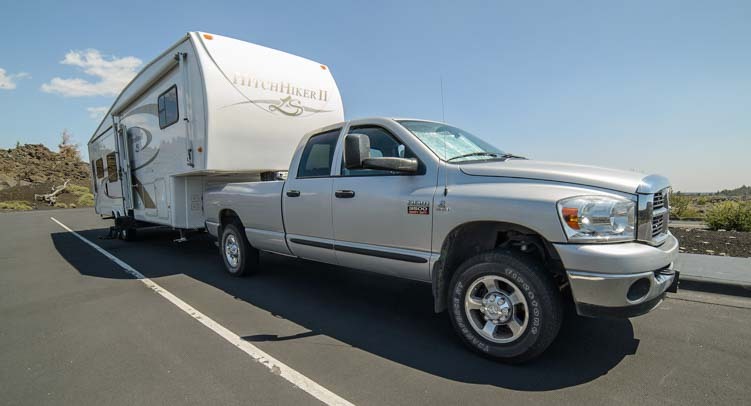 December 2015 – When we bought our Dodge Ram 3500 single rear wheel truck brand new in 2007, we purchased it to tow our lightweight full-time home, a 7,000 lb. 2007 27′ Fleetwood Lynx travel trailer. For such a big, monster truck, that little trailer was a featherweight. But within a year, we had upgraded our year-round living quarters to a 36′ 2007 Hitchhiker Fifth Wheel trailer, a beast that weighs in at 14,000 lbs. fully loaded. 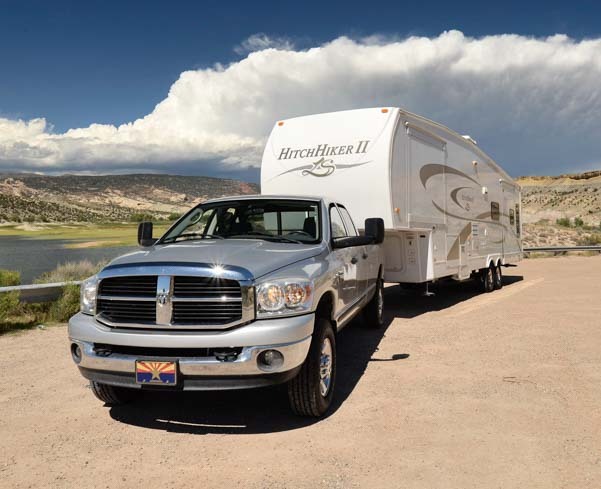 Our ’07 Dodge Ram 3500 truck and 36′ Hitchhiker fifth wheel trailer — at home on the road! This trailer was the absolute maximum size our truck could tow safely. 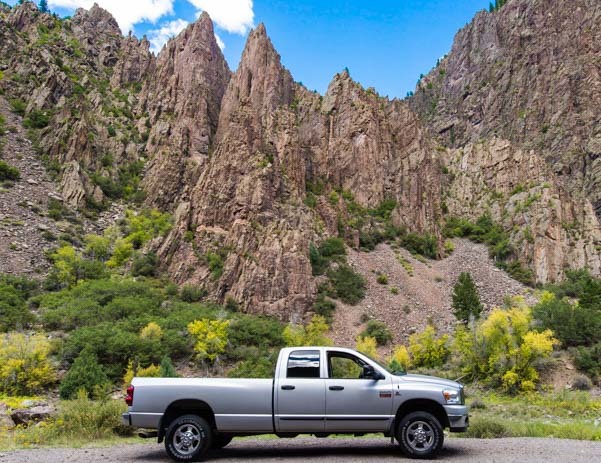 Over the years, our truck has valiantly lugged our home up and over 10,000′ mountain passes in Colorado, Utah, Wyoming and other mountainous states and endured many a 7% or steeper grade in the process. The truck’s GCWR (Gross Combined Weight Rating) is 21,000 lbs., but our truck and trailer weigh 22,150 lbs. when hitched up and fully loaded. The truck’s GVWR (Gross Vehicle Weight Rating) is 10,100 lbs., but the truck weighs 10,850 lbs. when the trailer is sitting on its back. When it comes to safety on the road, we’ve been pushing it! Our big beautiful trailer maxed out our big beautiful one ton truck! We gave our truck bigger lungs and stronger muscles by installing a K&N Cold Air Intake Filter and an Edge Evolution Engine Tuner (installation and review HERE). We also gave it broader shoulders to carry heavy loads by installing a Timbren Suspension Enhancement System. These upgrades helped, but even though the truck was very happy towing our trailer on flat roads, it worked awfully hard when it was put to the test on mountain grades. Frankly, the transmission and modest rear end were not really 100% up to the task in the Rockies. Back in 2013 when we moved off of our sailboat and said goodbye to the cruising lifestyle, and recommitted ourselves to living the RV lifestyle full-time, we began tossing around the idea of upgrading our rig. The beauty of having a towable RV is that we could replace the RV’s engine and drivetrain independently without affecting our living quarters (and vice versa). A new truck would revolutionize our driving experience on the road but not cost nearly as much nor be nearly as chaotic as replacing our home at the same time. We were also toying with the idea of getting a truck camper someday so we could travel to more remote places. The weight of many truck campers requires a dually truck (four rear wheels instead of two to support the weight), so we began flirting with the idea of buying a dually. 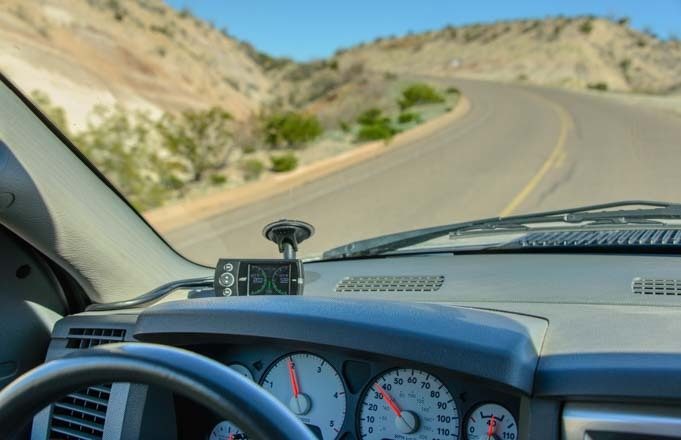 We had a lot to learn about the latest trucks, and we studied everything we could about the myriad of improvements that diesel trucks have undergone since we last paid attention in 2007. Our ’07 Dodge Ram 3500 single rear wheel truck was great, but a stronger truck would be better. We began test driving new trucks right away when we arrived back in San Diego after our Mexico sailing travels. 2013 models were on dealer lots at the time, and in the ensuing months, the 2014 models began to arrive at the dealerships. Since then, we have taken Ford, Chevy and Dodge trucks on over 200 miles of test drives, and visited at least 25 dealerships across the country. Mark subscribes to Diesel Power Magazine, and he has studied the subject of diesel trucks endlessly. After much deliberation, we finally decided that a Ram 3500 dually was our truck of choice. 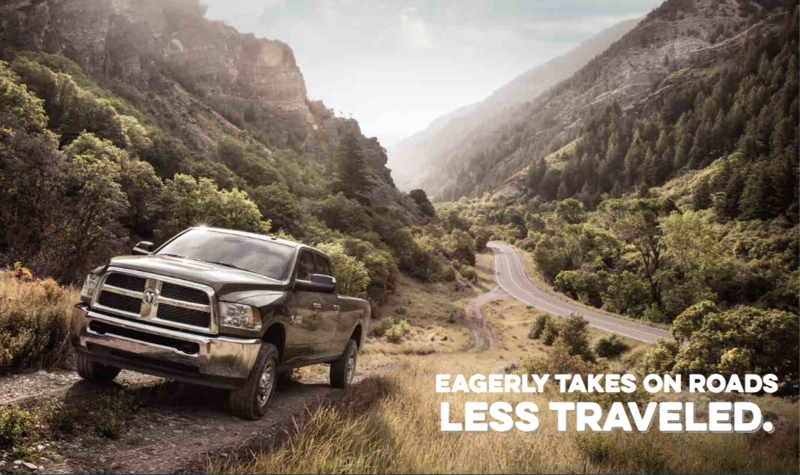 When we saw that the centerfold for the 2016 Ram Trucks brochure mentioned Roads Less Traveled, we had to have a 2016! 2016 Ram Trucks Brochure centerfold — It was meant to be!! Diesel trucks improve every year, and this new one has a whopping best-in-class GCWR of 39,000 lbs as compared to the 21,000 lbs of our old truck. And that was just the first item on a long list of eye-popping stats. Our only question was where it would be best to buy it. Because of our mobile lifestyle, we could buy it in any state at any dealership. By the summer of 2015, Mark had come to know more about each option on the new Ram trucks than most of the salesmen we talked to. He also knew exactly which options he wanted and which ones he didn’t want. Unfortunately, this made it nearly impossible to find “the ideal truck” just sitting around somewhere on some random Dodge dealership lot. Throughout our 2015 travels across 24 states, we checked in at almost every Dodge dealership in almost every town we visited to see if they had “our truck.” None did. We repeatedly searched online to see if a detour of 100 miles in this direction or that would bring us to our dream truck. No dice. We test drove Ford, Chevy and Dodge trucks all over the country for two years. 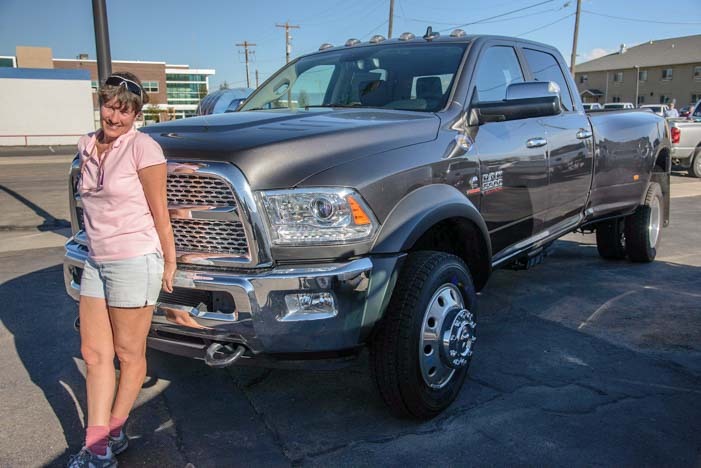 In Wyoming, we even test drove a custom 2014 Dodge Ram 5500. Very cool, but very stiff! We soon realized that we would have to place an order for our truck in order to get the combination of options we wanted, and we would have to wait 8 weeks for it to be built and shipped to a dealership. We were in perpetual motion driving from Arizona to Nova Scotia and back in 2015. Our favorite dealership was Marshall Motors in Salina, Kansas, where diesel truck salesman Alex Thatcher was the most knowledgeable of any we’d met. But we wanted to keep moving to get back to Arizona for the winter. Logistically, ordering a truck in Arizona made the most sense for us because we were going to be there for a few months. But which dealership would be best? 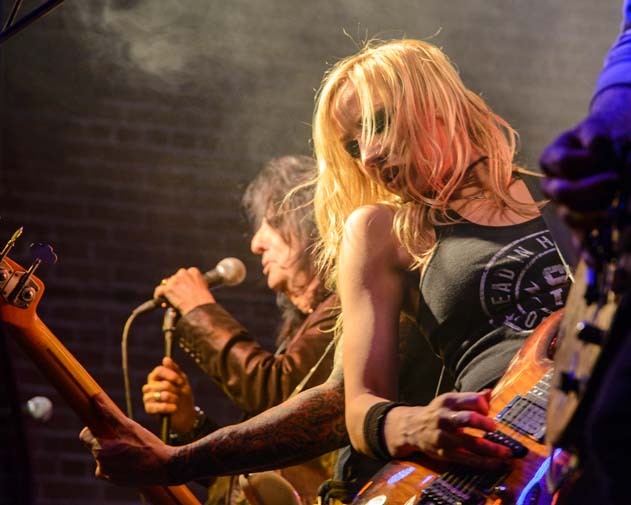 We got a tip that Airpark Dodge in Scottsdale, Arizona has an annual Christmas holiday “Buy a Car Get a Guitar” promotion where anyone that buys a new car also gets a glistening new electric guitar signed by rock star Alice Cooper as part of the deal. When Mark heard that, he was sold — We were THERE! Mark has been a huge Alice Cooper fan since the day the rock star exploded on the scene in 1971, and we listen to his music all the time. Mark turned 18 shortly after Alice Cooper’s clever and poignant song “I’m Eighteen” came out, and he graduated from high school the year Alice’s hit “School’s Out” soared to the top of the charts. 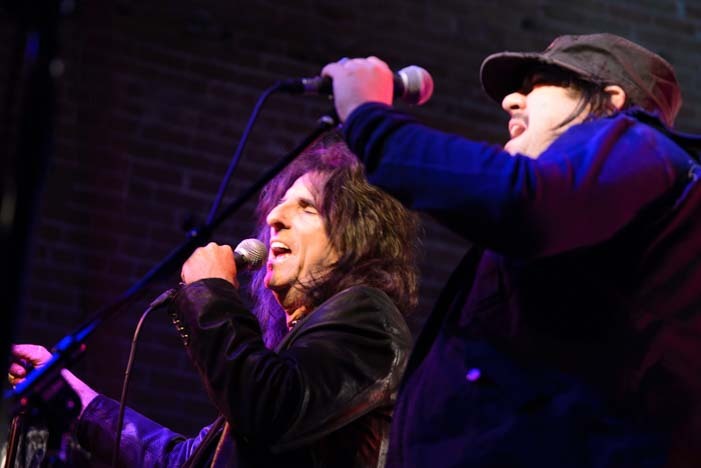 Alice Cooper and Mark were both born in Detroit, and both spent their adult lives in Phoenix, Arizona. 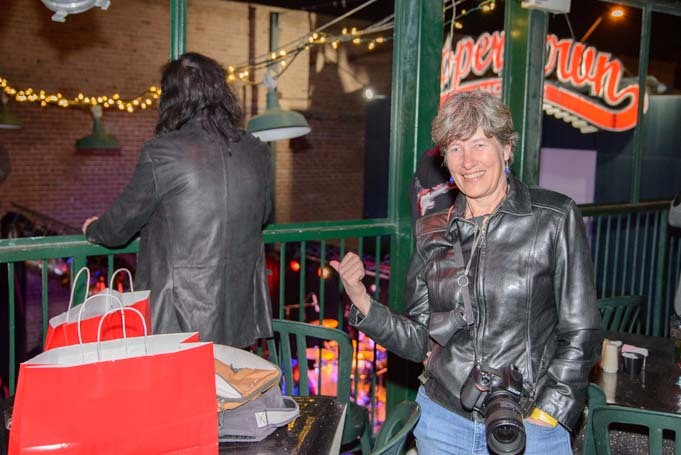 Mark didn’t move across country just to be like the rock star, but he went to a ton of Alice Cooper concerts in both cities over the past four decades, and he dressed up as his idol on many a Halloween night! 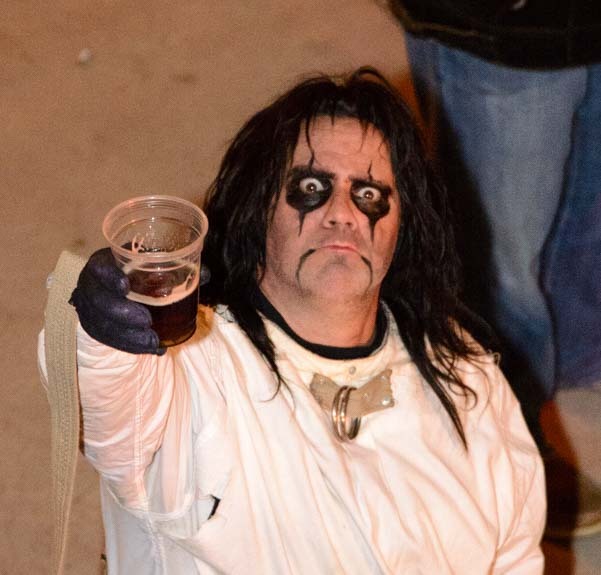 Wild eyed fans love to dress up as Alice Cooper, even to this day. 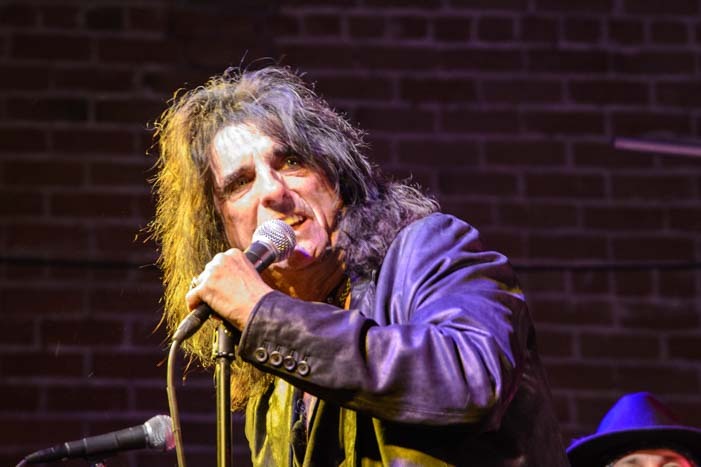 Mark morphed into Alice Cooper for Halloween many times! 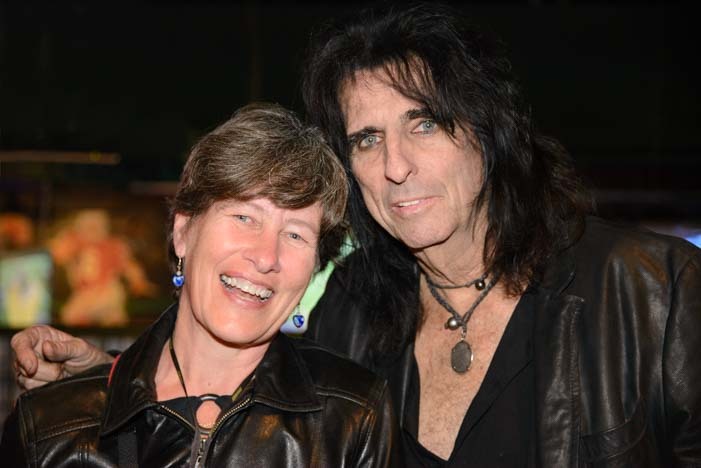 Before we started traveling full-time, back when Mark and I were avid cyclists, we rode our bikes past Alice Cooper’s house all the time. Mark would always point it out, and we would wonder what life was like behind the huge front doors that had handles shaped like snakes. 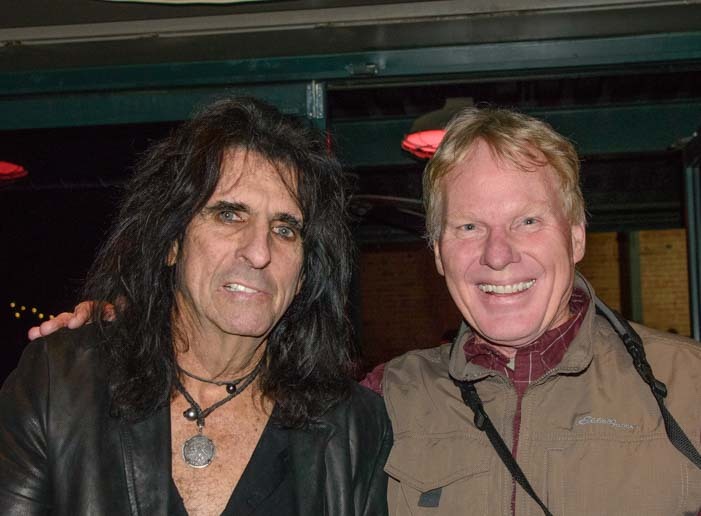 There was no doubt that now, if Mark could lay his hands on a guitar that Alice Cooper had actually touched and signed, he would be totally beside himself. We knew exactly where we would be ordering our new truck! Buy a Car, Get a Guitar starts Dec. 10th. OMG — We sure found out!! 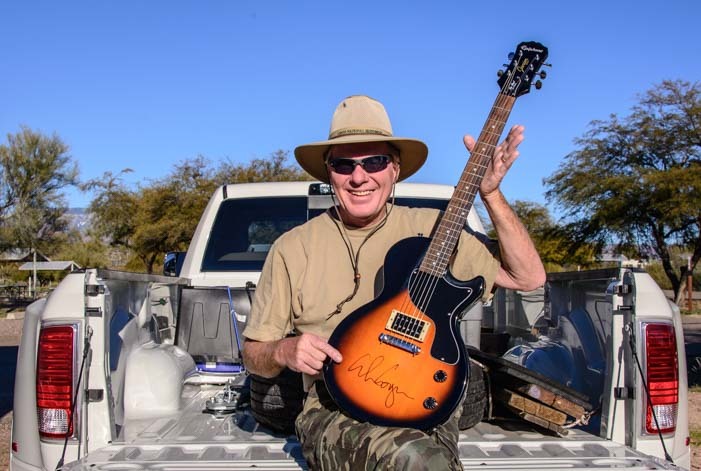 To begin with, when we got to Airpark Dodge to pick up our new baby, Mark was given his signed Alice Cooper electric guitar. He was in seventh heaven! 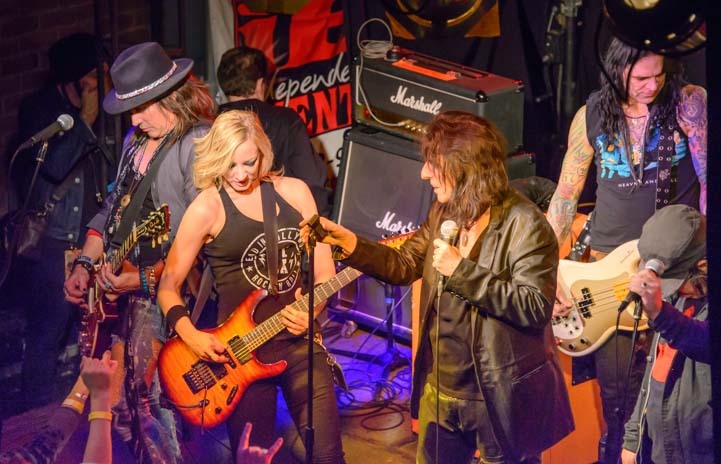 A new electric guitar signed by Alice Cooper – Wow!! Oh…. and a new truck too. 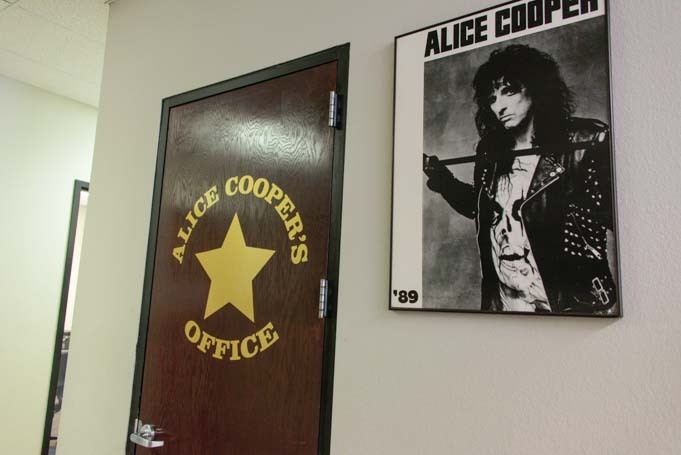 As we admired the Alice Cooper memorabilia on the walls of the dealership, we discovered that the GM of Airpark Dodge is golf buddies with Alice Cooper. To our amazement — and dismay — we found out that the week before we got there, Alice had been hanging out at the dealership kick-starting the promotion. Oh, man. How did we miss seeing him in person at the dealership?! We were so bummed!! But then we found out that “Coop,” as his friends know him, was going to be performing at Talking Stick Arena in downtown Phoenix two nights later. 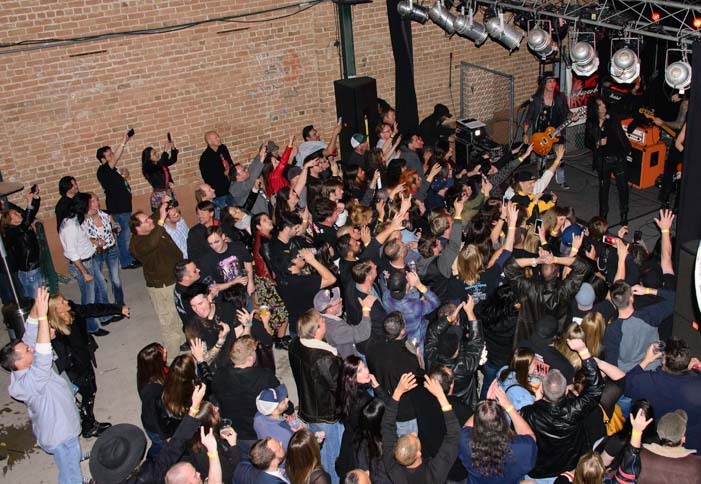 Concert tickets were sold out, but afterwards he was going to host a special party at his bar/restaurant across the street (called Cooperstown) to benefit his teen rock center and rock music school in Phoenix called Solid Rock. With that tid-bit of inside scoop, we dashed downtown on the appointed night, and before we knew it, we were mingling with a crowd of other fans at Cooperstown, waiting for the official concert across the street to end and for Coop to come on over and play at his bar. 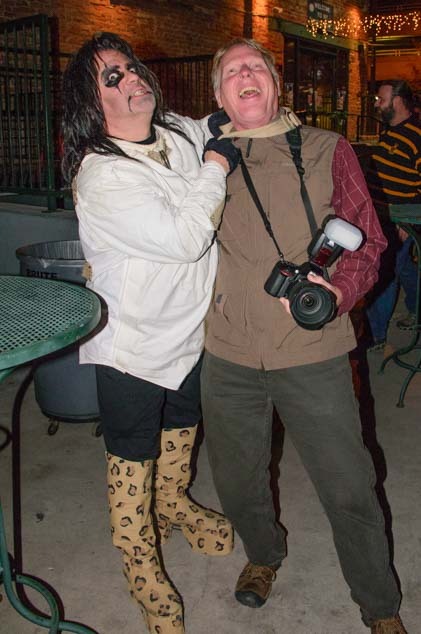 Suddenly, a crazy Alice Cooper lookalike in a straight jacket and tall leopard boots grabbed Mark by the neck. Yikes! Ya gotta watch out for those rabid fans! He let Mark go, and we wandered around admiring the posters and wacky stage props and guitars and other memorabilia that cover the walls of Cooperstown. Suddenly, Alice Cooper appeared. He’d removed his stage makeup from the big concert across the street at the arena and was mingling with his fans around the restaurant. He knew some of them and recognized others from previous encounters. 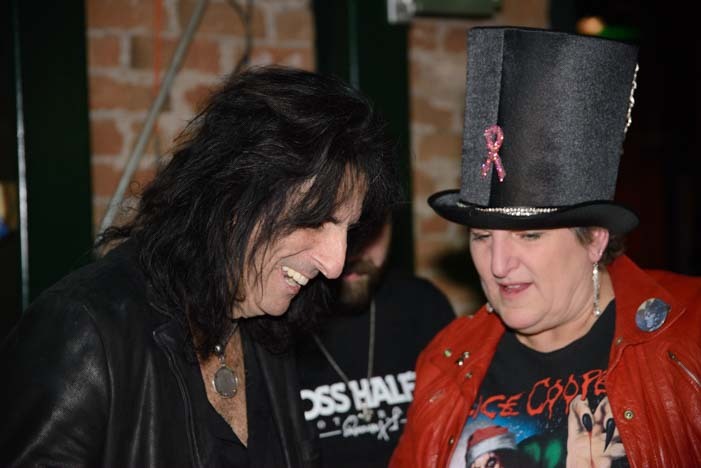 Alice Cooper chats with a fan who’d brought him a special gift she’d made. His son Dash got up on stage and performed with his band Co-op (“Coop” with a Dash !!). I had to smile as he leaned over the rail to watch his son in action. Moments later, he turned around, and we caught him just long enough to get some photos with him. He was very obliging, and oh lordy me, we were both totally star struck! Moments after Dash’s band finished, Alice was up on stage with his own band, rocking out just steps from where we stood. Holy Smokes! We laughed and sang along and clapped and cheered with everyone else. This was AWESOME!! Between singing along, we both managed to snap some fun pics. 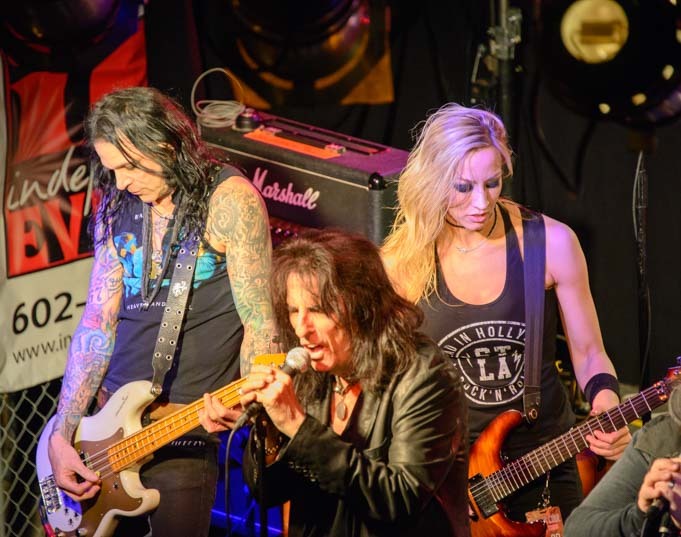 Not only was Alice Cooper phenomenal, but his band was incredible too. 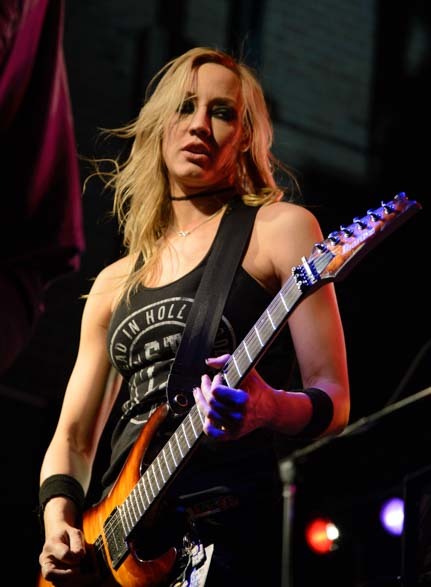 His guitarist, Nita Strauss, is stunning in every way! 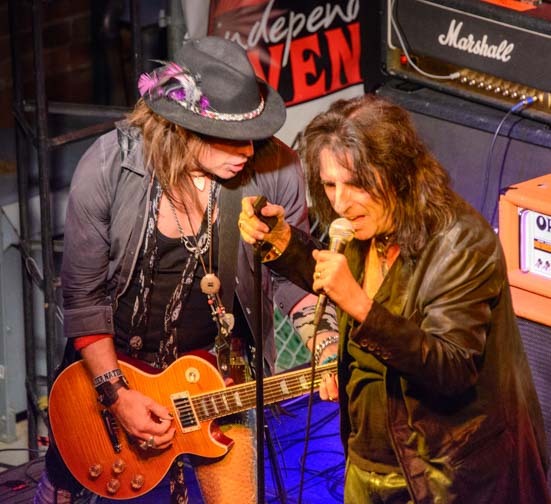 All of a sudden, Alice Cooper’s son jumped back on stage and began singing with his dad. How cool is that?! What a fantastic night this was. What fabulous memories!! Needless to say, we were gushingly excited. And we listened to Alice Cooper songs for the next week, nonstop. Oh… and our new truck? 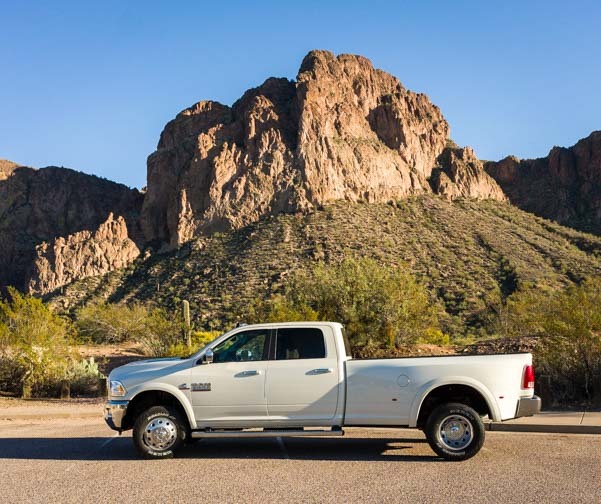 If you are in the market for a truck, swing by Airpark Dodge in Scottsdale and see if the Coop is in! If he isn’t, talk to our salesman, Ed Kulas. “Elected” — Very appropriate for the 2016 election year, or for any election year for that matter. 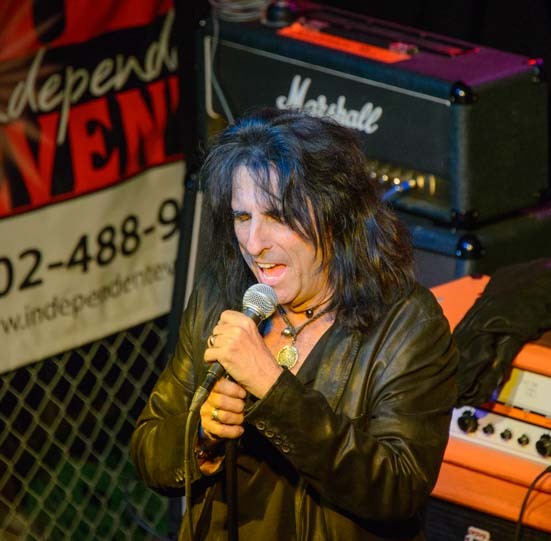 Alice Cooper wants to be elected, and he promises the formation of a New Party, a Wild Party… a Beer Party!! An interesting morsel we discovered in all of this was that Alice Cooper was approached and offered tons of money to do a reality TV show about his life today. But when the producers found out he’s a sober, drug-free family man who plays golf six days a week and goes to church every Sunday, they went with Ozzie Osbourne instead. This entry was posted in Boats & Rigs and tagged New, Travel, Truck Trailer Hitch, WP Travel by Roads Less Traveled. Bookmark the permalink. I know exactly how you feel in finding the perfect truck. I bought a 2015 Ram Laramie Longhorn dually crew cab 4×4 CTD and 4.10 gears to pull my DRV Suites 5th wheel. To find the one that had all the options I wanted (which is almost all of the ones offered by Ram), it required me to buy from a dealer that was a thousand miles away! Can you say road trip? I love mine, and you’ll love yours, too! Sounds like it was a fabulous road trip for you, David, and what a thrill to have a long drive to bring it home too. We are really loving our truck — so many great features and so much smooth power!!! I have been looking at buying a new truck for some time. Since I read your original post way back when , that you posted about reading an article in Diesel Power Magazine. I went to the grocery store that day and bought a copy. I have since subscribed to the magazine. I test drove many a Ford, a Chevy and a Jimmy, I have a lot of experience with Cummins Diesel Engines. (I drove Semi’s for a living) Congratulations on your new Truck. I ordered mine on 04Jan16 it’s set to be built 30Jan16 and set for shipment on 02Feb16, so it should be at my dealer on or about the 16th or 19th of Feb.
How cool is that?! Mark really enjoys that magazine and has learned a lot from it. Cummins is a superior engine, and the Ram Laramie packaging for it is pretty darn sweet!! Enjoy that new truck — I’m sure you’ll love it as much as we love ours!! Oh my . . . Alice Cooper and a new truck! I have to say, we had an experience with Alice back in ’91. 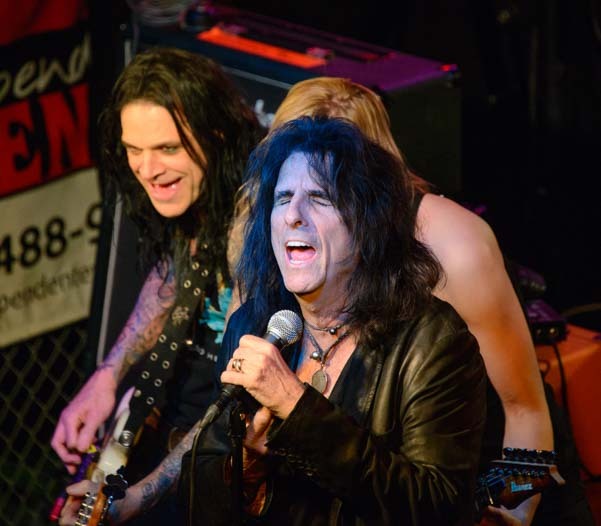 Have you ever heard of the Alice Cooper House? The owner of that house was our neighbor. You could see it from our back yard. Not quite the same experience that you had, for sure! I’ve copied a link to a Youtube video that shows what I’m talking about below. Anyway, this post certainly brought back some memories. Thanks. On a positive side, we ordered a new 2016 3500 Laramie a few days ago. Already mentioned it under your truck post. I was wondering how long it took for you to get delivery on your preorder? We were told by our dealer it would be six to eight weeks. Is that about what you experienced? 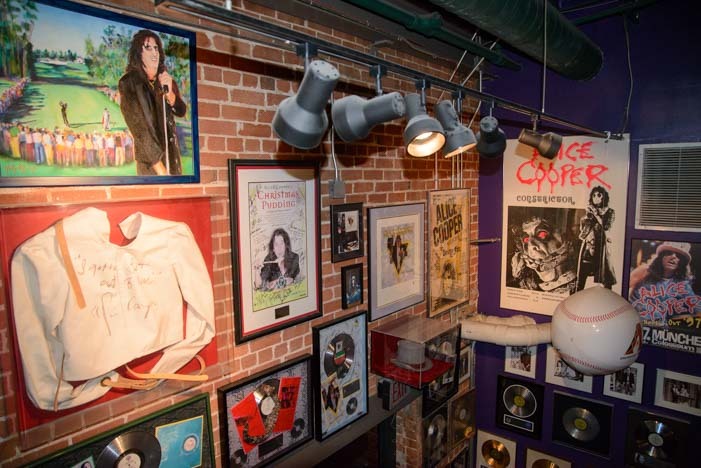 Here’s the link to the Alice Cooper House, enjoy . . .
What a crazy story! What a crazy neighbor!! I saw your comment about ordering a new truck — congrats! It took about 10 weeks for our truck to come in. So, be patient. I know that’s hard — we went nuts waiting!!! !